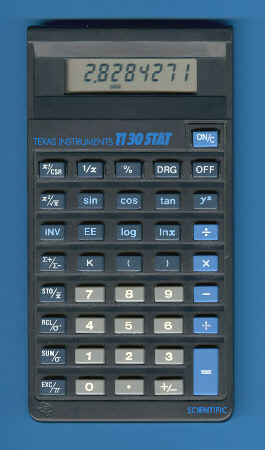 This TI-30 STAT manufactured end of 1989 looks very similar to the TI-30 STAT (1989). We don't know the year of the introduction, the box states © 1987, the manual © 1989. There are more designs of the TI-30STAT, a major milestone was the introduction of the TI-30 STAT (1989) featuring a real "2nd"-key. Recently we noticed an identical TI-30 STAT with the date code RCI 48 85! © Joerg Woerner, October 4, 2002. No reprints without written permission.